Explore paved paths with the kids, mountain bike on challenging single track or sightsee from the saddle of a road bike. 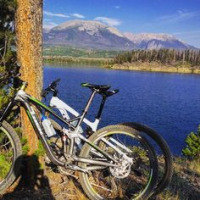 If you're looking for bicycle clothing & accessories, rental bikes or need a fast bicycle repair, visit one of the many exceptional bike shops in Dillon, Keystone, Frisco & Breckenridge. You'll also find maps, advice & the best local tips! See All Shopping & Bikes items in Summit County, CO.